Lord don't let this be like 2018! Almost 900 users! Growth is always a good sign. This year we have 892 contestants. I actually had over 1,000 users but some people missed the rules and chose companies on exchanges that were excluded from the contest. I did my best to reach out to them, sending out hundreds of private messages...sigh. Oh well, I tried! 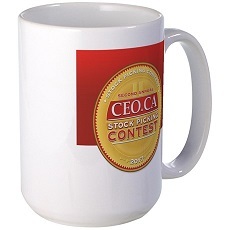 Eric Coffin from HRA Advisories will be giving away a 2019 CEO.ca Coffee mug to the top 50 winners as he has for the last two years. Robert Hirschberg from the #Bergdex is going to give CEO.ca logo'd leather jackets and hats to the top 10 winners. 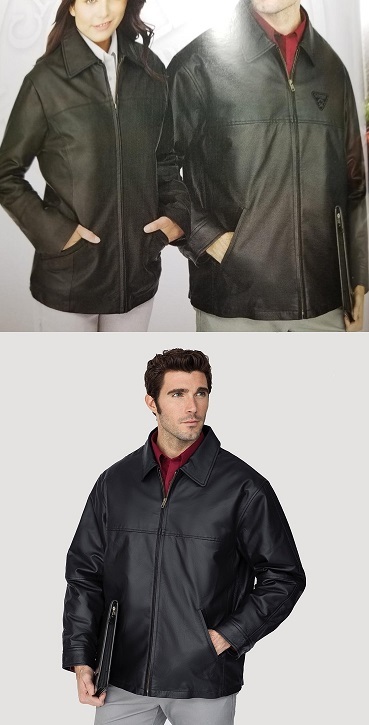 Additionally, if he wins, he said he will buy everyone in the contest a CEO.ca logo'd jacket! So lets all cheer on @robby for the win! 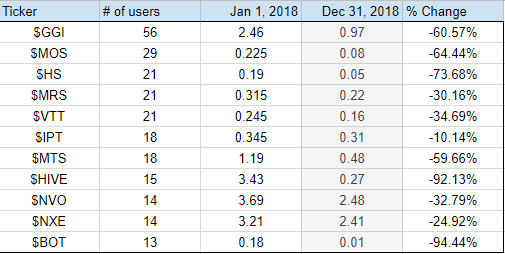 He's in 53rd which means he is currently doing better than 94% of users. 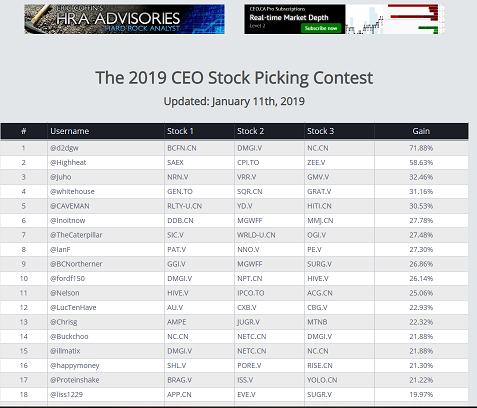 The contest will be updated every Friday after market closes so it is currently updated as of January 11th. WHILE I HAVE YOUR ATTENTION --- Please watch the video and look at the two images below. I have a couple ideas I want to share. I currently have over 100,000 data points compiled from hundreds of company websites, defunct Google JSON scripts, SEDI etc. Anyway, if you think you would be interested in having a tool such as the one above please let me know. If there is significant desire I will get it built. This is just one of those ideas that I would like to build, I just don't know if its really as cool as I think it would be. 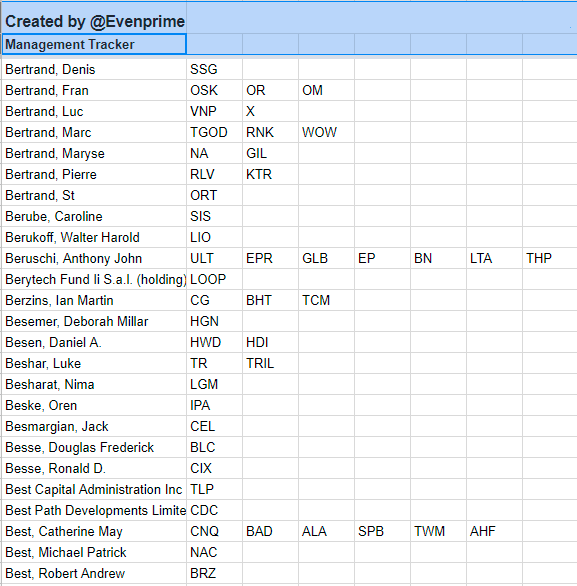 I envision a user based system that allows them to store a list of liked and disliked management. 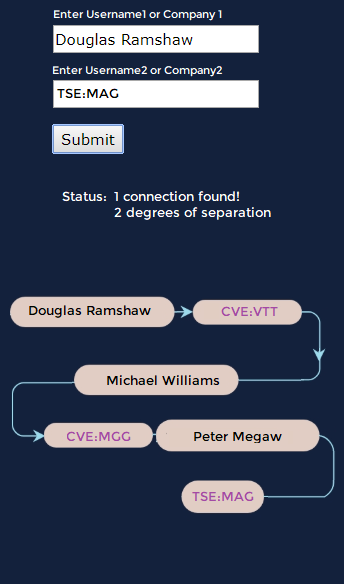 When doing due diligence on a company, users can quickly see if there are past connections that may be of interest. All the best in 2019 and good luck everyone! Stay diligent - stay safe! Disclaimer: This article is intended for informational purposes only! All statements in this report, other than statements of historical fact should be considered forward-looking statements. These statements relate to future events or future performance. Forward-looking statements are often, but not always identified by the use of words such as "seek", "anticipate", "plan", "continue", "estimate", "expect", "may", "will", "project", "predict", "potential", "targeting", "intend", "could", "might", "should", "believe" and similar expressions. Much of this report is comprised of statements of projection. These statements involve known and unknown risks, uncertainties and other factors that may cause actual results or events to differ materially from those anticipated in such forward-looking statements. Risks and uncertainties respecting mineral exploration companies are generally disclosed in the annual financial or other filing documents of those and similar companies as filed with the relevant securities commissions, and should be reviewed by any reader of this report. The author does not work for CEO.CA. The views expressed in this report are the personal views of the author and do not reflect those of CEO.CA. Nothing in this report should be construed as a solicitation to buy or sell any securities mentioned anywhere in this report. This article is intended for informational and entertainment purposes only! Be advised, the author is not a registered broker-dealer or financial advisor. Before investing in any securities, you should consult with your financial advisor and a registered broker-dealer. Never, ever, make an investment based solely on what you read in an online report, including this one, especially if the investment involves a small, thinly-traded company that isn't well known. Past performance is not indicative of future results and should not be used as a reason to purchase any stocks mentioned in this report or on this website. The author shall not be liable for any damages, losses, or costs of any kind or type arising out of or in any way connected with the use of this report. You should independently investigate and fully understand all risks before investing. When investing in speculative stocks, it is possible to lose your entire investment. Any decision to purchase or sell as a result of the opinions expressed in this report will be the full responsibility of the person authorizing such transaction, and should only be made after such person has consulted a registered financial advisor and conducted thorough due diligence. Information in this report has been obtained from sources considered to be reliable, but the author does not guarantee that they are accurate or complete. The author’s views and opinions in this report are his own views and are based on information that he has received, and assumed to be reliable. The author does not guarantee that the companies mentioned in this report will perform as he expects, and any comparisons made to other companies may not be valid or come into effect. We do not undertake any obligation to publicly update or revise any statements made in this report.